Scrum Alliance a not for profit company, was established in the year 2001 and is the leading, and high-ranking organization in providing certification and membership for the Agile population. During the 1st Week of April 2017, Scrum Alliance declared its joint venture with LeSS Company to support extensive implementation of Large-Scale Scrum (LeSS). Netherland, CO, The LeSS Company began its journey from the year 2014 with the intention of encouraging “Large Scale Scrum”(LeSS), by offering training not just for certification but to master in LeSS. The creators of the company are Johan Schoenmaker, Craig Larman, Bas Vodde. Before we discuss the advantage and problems due to this alliance, let me just give you the actual stuff announced in the press release. The acting CEO Lisa Hershman said that the vision of Scrum Alliance being “Transforming the World of Work” can be achieved through identifying the importance of scaling agility. Keeping in mind the need for the ease of doing so and holding the Scrum values, they are looking for providing organizations an opportunity for scaling Scrum. This thought process made them realize the need for the collaboration with the LeSS Company. Hershman also added that their combined aim is to offer training and coaching to the agile community with the skill to recommend LeSS education and training as part of their suite of programs in the coming years. What are the benefits that Scrum Alliance and LeSS are hoping from this partnership? They are looking at occasions to leverage the “world of work” by appealing at the senior management levels and winning organizational design, as both are essential for scaling. Providing knowledge and training for scaling agility come together to pave way for a most important entry into remarkable and powerful domains for CSTs, CECs, and the rest of Scrum Alliance. There was no solution to any scaling questions with Scrum Alliance until now and this joint venture with LeSS will provide all the necessary solutions. Scaling Scrum is the key requirement, a joint venture between LeSS and Scrum Alliance will take care of this need of the certification companies. Companies have not started using LeSS greatly. Though there are use cases available they are not firm in the outside world yet. 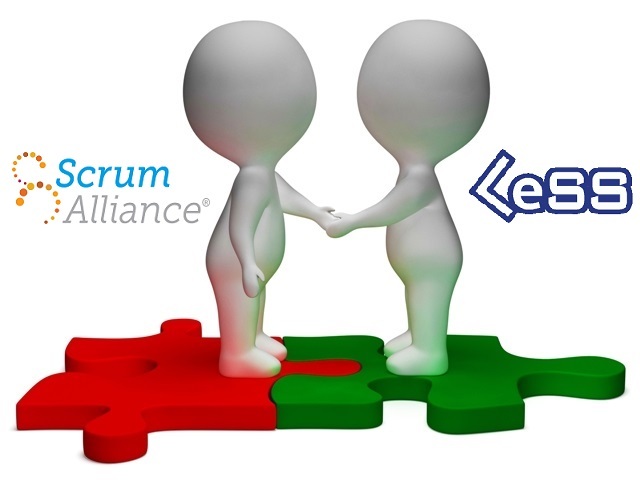 The association with Scrum Alliance will bring a radical change in this. If LeSS terminology is not used properly then an irregularity is formed amid of the strategy and reality. This destroys the entire purpose of the scaling concept. LeSS hypothesizes are not only valid in large-scale settings, however upcoming agile experts are not realizing this fact and think that the organizations implementing Scrum in its basic form only and not trying to scale. Without providing clarity to this mistaken belief the purpose of the collaboration may not be achieved. In spite of trying to understand the pros and cons of this association upon hearing the announcement, we must wait and watch the action in ground.